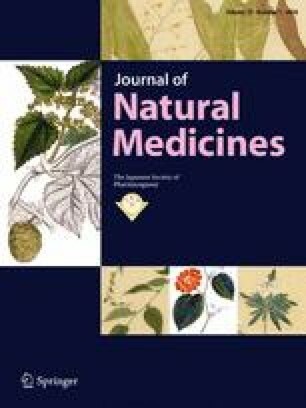 This research examined the production of fungal metabolites as a biological response to Kampo medicines. Shimbu-to (SMB) is a Kampo medicine composed of five herbal components: peony root (Shakuyaku), ginger (Shokyo), processed aconite root (Bushi), Poria sclerotium (Bukuryo), and Atractylodes lancea rhizomes (Sojutsu). High-performance liquid chromatography (HPLC) analysis of the fungus Aspergillus nidulans CBS 112.46 incubated in potato dextrose broth supplemented with SMB extract revealed emericellin (2) as the major peak and new xanthone analogues 24-hydroxyshamixanthone (1), shamixanthone (3), epishamixanthone (4), pre-shamixanthone (5), and variecoxanthone A (6) as minor peaks. The structure of 1 was determined by detailed analysis of 1D-NMR, 2D-NMR, and MS data. The results suggest that SMB extract regulates the biosynthesis of emericellin and its analogues in A. nidulans. Further investigations revealed that glucose induces the biosynthesis of emericellin and its analogues in A. nidulans in a concentration-dependent manner. The online version of this article ( https://doi.org/10.1007/s11418-017-1156-8) contains supplementary material, which is available to authorized users. This study was supported by the Japan Society for the Promotion of Science (JSPS; Grant number 15K08005).